When I was a little girl, I use to watch the Country Music Awards with my parents. Not because I was a fan of the music at such a young age, but I loved to see the ladies of country music in their beautiful gowns. I always dreamed of the possibility of working on such beautiful creations. My dream came true. I’ve had the honor of having Dolly Parton as a customer for many years. I’ve fit and altered her stage clothes, street clothes, even her lingerie. When her favorite lounging robe was in tatters from years of use, I made a pattern and created Dolly a new one, while making a couple of requested changes. She was so impressed, that an order was placed for over a dozen more. Recently, I was asked to perform the same task for her make-up robe. A couple of changes were incorporated, soft terry fabric selected and her name added. With embroidery software, I developed a design that incorporated a butterfly into her name, giving it a very special and personalized look. In May, 2007, I was approached by her designer to make three robes for an upcoming shooting of Hannah Montana. Dolly is Hannah’s “Aunt Dolly” on the Disney series. Only one of the three robes would be selected. 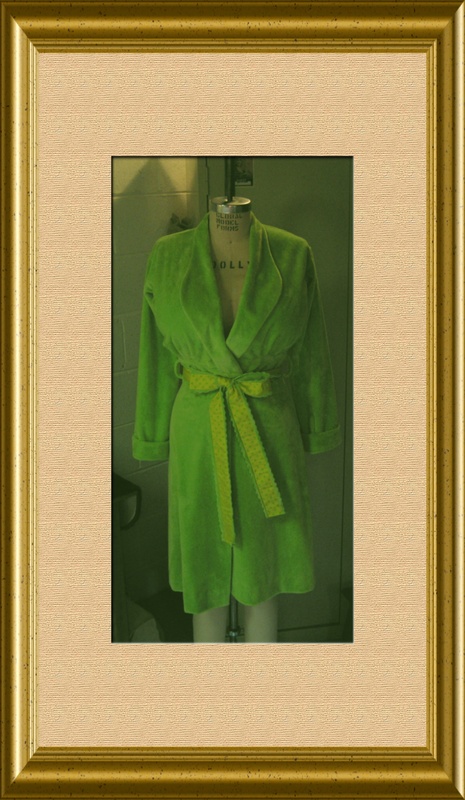 The favorite was in lime green fabric with a fun trim of bright yellow with lime green polka dots. The name of the episode is I Will Always Loathe You. It has been, and continues to be, an honor to work with such a wonderful person.